I have to admit I'm a big fan of Thomas Jane, whether in The Mist or The Mutant Chronicles, I think the man does solid work which is why I'm excited to see him in a straight up gangster film so stylish it looks like it might just be noir. We were the first to bring you news of the teaser back in November, and now there's a full promo trailer floating around, although this is heavy on the action whereas the teaser wasn't. IMDB says it'll be getting a release on April 1st (probably limited theatrical), I hope it hits Denver! On a side note, I don't think I'll ever get tired of hearing Steppenwolf's "Bad to the bone" used appropriately in film. Thomas Jane as the title character and Ving Rhames as his rival, "Boulder." 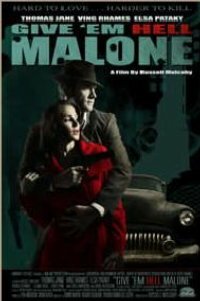 Malone, tough private eye, takes a job retrieving a case containing a mysterious secret. Bullets, fists, and blood fly as he fights through an army of thugs to protect the secret. Wow and Wow! Can. Not. Wait. The movie looks awesome,Jane is an action badass! Oh by the way quietearth, the song "Bad to the Bone" is sung by George Thorogood!!!!! Not Steppenwolf! Guess anyone can work for a movie site.